Yeah, It’s Cold but not for long! It is windy and cold still, but the GOOD news is that verano (summer) is coming and coming fast! November marks the beginning of the transition from the rainy season to the dry season, and the telltale signs are almost non-stop winds and the lessening of the afternoon rains. It also is great sleeping weather! Nights are chilly and breezy and because of the constant air movement, the air smells fresher, even in the Central Valley that is occasionally troubled by smog. Days are warm, less humidity here in the Central Valley, and just going out to do choirs is pleasant. The beaches of course will continue to be hot,but there too, there is a pretty contstant breeze to keep things manageable. Within days, the rain will cease and maybe about mid-December, we will have wet weather only about once or twice per week. By January, the rains will pretty much cease and we will have cookie cutter days of about 80-85 degrees and nights around 67-68 degrees. It will be near perfect… until June. Then the rains come again and everything turns green. Right now, our garden is brilliant green with a ton of flowers. Grass needs cutting every week. 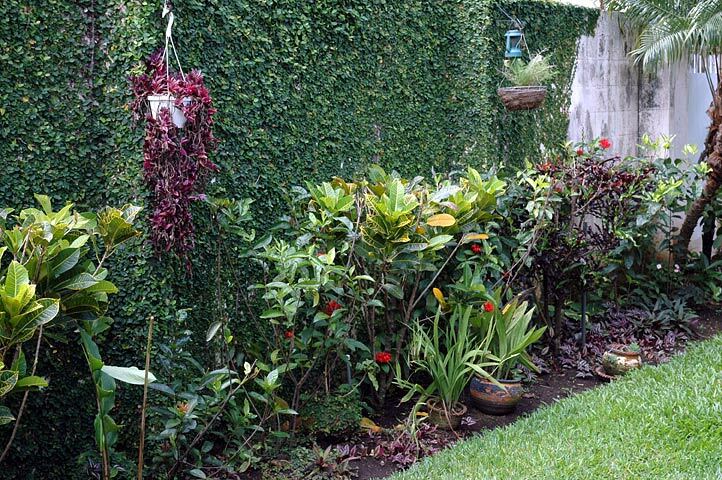 In the dry season, the flowers remain, but the grass turns brownish if not watered and we cut about once per month. Terrible shot of the garden I know- MUCH prettier in person! I love the transition seasons. When I lived in the US, my favorite times of the year were Spring and Fall. I am sure I am not alone in this. Of course December marks the tourist season. Higher prices and the hotels get booked earlier. My businesses get busier and I have less free time. Can’t have everything I guess. I am thinking about visiting Costa Rica and like to travel in the trasitional periods where the high season is ending or the low season is ending. I want to avoid the other tourists and save some money but still experience the best weather possible. What would be a good 2-3 week period to visit? Can someone tell me what the weather is like for the period of Nov. 10th thru Nov. 18th? Will it rain every day? How many hours per day? Mostly afternoon rain?Is the balance of the day sunny? My daughter is considering a honeymoon in CR during this time period. Be forthright and let us know if this is NOT a good time to visit. My Husband and I would like to come to CR the last of May or early June. This is the only time open because of work restraints. What’s the weather like? Where? This would be a fact finding mission for us as we have seriously considered relocating to CR. We understand that CR is a diverce country with different climates for different regions. Probably somewhere temperate. Read thru this blog that the best thing would be to rent for at least 6 mos. to “get the lay of the land”. Our Spanish is minimal but we’re learning. Any suggestions? My favorate past time is gardening..CR looks like my kind of place. The REAL COSTA RICA is a great help but even the thought of a six mo rental is daunting.. The REAL Costa Rica answers all your questions., Check weather. How about the weather on the Caribbean coast around Christmas time? Constantly rainy? Just an afternoon storm? I’ve been to the Pacific a few times, but I’d really love to check out the east coast of CR during the holdiays – worth it? planning a trip from Sept 1- 9th. Will it be a total washout? Starting off in San Juan, Arenal, Monteverde to Guanacaste. (excuse my spelling). Should I go another time. Was is the rain typically like during this time?